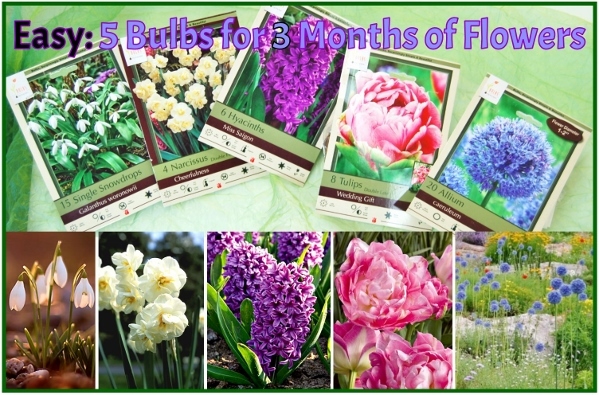 5 Bulbs for 3 Months of Flowers! We’ve cooked up a fun idea for your garden with bulbs. Combine these five bulb varieties and take a half an hour or so to plant these into a new garden or even in and around your existing perennials. All of these bulbs would prefer to to be in full sun but they can tolerate a little shade. They are all winter hardy. For very early spring, in April, the snowdrops will surprise you with their flowers and leaves when almost nothing else is awake. These sweet little white flowers will grow to 6-8″ and deer don’t like to eat them. They are perennial and will even bloom in a snowstorm! They look great in clusters. These will bloom after the Snowdrops. Hands down, daffodils are my favorite. Because these are double, they have extra petals and sometimes extra center trumpets so they add a special touch to the garden. These daffodils are fragrant, deer resistant and measure 14-16″ tall. Both the Narcissus and Snowdrops will naturalize; that is, over the years the clumps will get larger. Here’s where the perfume bottle will be kept in your garden. The fragrance of hyacinths is legendary. ‘Miss Saigon’ will bloom about the same time as the Narcissus. Won’t they look great together? Put the hyacinths in front since they reach just about a foot in height. They too are deer resistant. This is like having peonies blooming early in the garden! This is a late tulip so expect to see it in May, weather depending. Just imagine how this large, double pink flower will look with the trees and shrubs greening around them. This one will reach 16-18″ on sturdy stems. Imagine the surprise of having these wonderful blue highlights flowering in June. That’s the nature of bulbs sometimes. We forget what we planted and are greeted with a happy surprise. At 16″ these tall blue drumsticks will smell great and bring a cheerful, deer resistant, highlight to the garden. When they are done flowering, allow the foliage of bulbs to ripen completely. That is, let it get brown before trimming it away. That’s what perennials are for! Hide the brown foliage by combining bulbs with plants like Salvia, Nepeta, Russian Sage, Black Eyed Susans, Sedum and more.